Hillsboro?s Nicholas Mueller goes after a ?chicken wing? 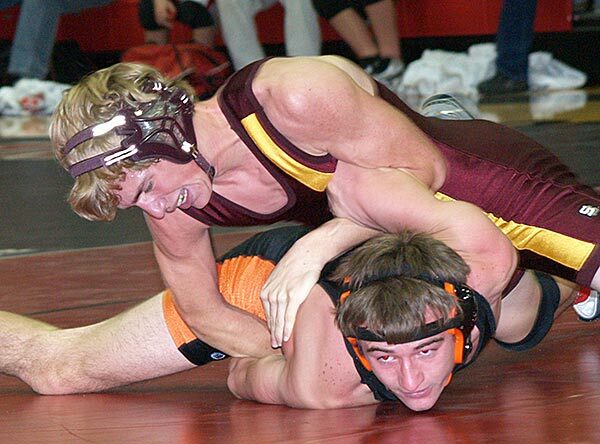 hold against Jake Brady of Smoky Valley during their match at the Hesston Invitational on Saturday. Mueller won the match, 11-6, and claimed an individual title at 135 pounds to remain undefeated for the young season. Courtesy photo. 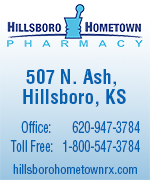 Hillsboro wrestlers finished second and Marion third at the 17-school Hesston Invitational Tournament on Saturday. The Trojans finished with 155.5 points to trail Smoky Valley at 163. Marion tallied 130.5 points. The Trojans won titles in three weight classes: Nicholas Mueller at 135 pounds, Tyler Jones at 145 and Jacob Yoder at 189. The Marion High School girls were swept by Garden Plain, Inman and St. John at the Inman tournament and stand at 1-3 for the season. 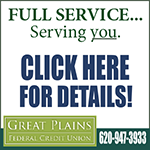 Garden Plain defeated the Warriors 72-43 Tuesday. Inman beat Marion 57-52 Thursday and St. John won 54-17 on Friday. The Marion boys were swept at the Inman early-season tournament and now stand at 1-3 doe the season. A 73-56 loss to the St. John Tigers Friday came on the heels of a 59-50 loss to the host Teutons and capped a long week that began with a 99-77 loss to Garden Plain. Hillsboro senior Amy Neufeld flips a no-look pass to an open teammate during Monday?s game against Smoky Valley. Neufeld scored nine points in the 47-40 loss. Hillsboro?s Daniel Jost puts up a shot inthe lane during Monday?s win over Smoky Valley. 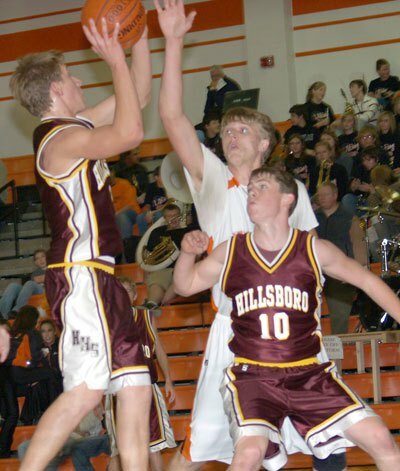 Hillsboro High opened the 2007-08 basketball season with a split of games Monday against Smoky Valley in Lindsborg. The Trojan girls led for most of the first half, but Smoky Valley?s Rhys Pihl fueled a second-half charge to secure a 47-40 win for the Vikings. Hillsboro High School wrestlers opened the new season Thursday at Lindsborg by winning two of three dual matches against some of the top squads in the Mid Central Activities Association. Marion boys and girls claim victories over Chase Co. The Marion High School boys clobbered Chase County 71-42 Friday. Justin Heidebrecht started fast. Calvin Jeffrey missed the mark with his first shot, and Bulldog forward Tyler Duncan grabbed the rebound. total in the frame making 18-10 the halftime score.